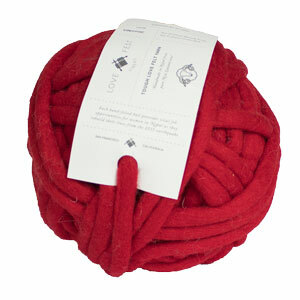 Tough Love from Love Fest Fibers is a super chunky rope of 100% New Zealand wool that is hand felted by artisans in Kathmandu, Nepal. Tough Love definitely lives up to its name since it's a strong and resilient felt that is perfect for structural knitting and crochet projects such as rugs, poufs, pet beds and baskets as well as macrame and weaving projects. Each jumbo ball contains 50 yards of super bulky yarn that is just waiting for you to craft it into something even more amazing using US size 50 needles, size U crochet hooks, or even just your arms! Love Fest Fibers Tough Love Stripe Yarn is a similar yarn: 100% wool, super bulky (11 sts or less/4 in), 1 sts / inch, 700 gram, 100% new zealand wool, and 50 yards. You may also like Rowan Big Wool Yarn, which is another similar yarn: hand wash and super bulky (11 sts or less/4 in). What about yarn that have the same look and feel? Find more yarn with a smooth / uniform, dense and firm texture. You may enjoy taking a look at the , and Love Fest Fibers Tough Love Ridge Basket kits all using Love Fest Fibers Tough Love Yarn. Hopefully our suggested project ideas for Love Fest Fibers Tough Love Yarn can help you come up with your next exciting new project idea!